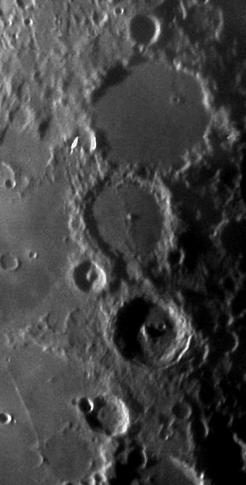 The three large craters from top to bottom are Ptolemaeus, Alphonsus, and Arzachel. Rupes Recta (aka the Straight Wall) can be seen in the lower left corner. This shot is from a twenty-one day moon taken at f/20. It is an eleven frame mosaic.